Aikido is a traditional, non-competitive, Japanese martial art, involving throwing and pinning techniques, the use of staff, wooden sword and knife, and the techniques of sword-drawing. Aikido study is totally committed to firm, sensitive contact with the partner, natural, flowing movements, and a vigorous, harmonious spirit. Aikido is equally suitable for men and women. Partners learn specific techniques and general principles by taking turns to attack with a grasp or strike. Emphasis is placed on safe rolling and falling methods, so that partners can learn to receive techniques with energy and confidence. 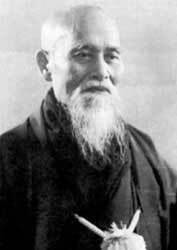 The Founder, Professor Morihei Ueshiba, developed Aikido in Japan in the early part of the 20th century. Classes at Gen Pu Kan pursue the insights and interpretations of Prof. T.K. Chiba, 8th Dan, a direct student of the Founder.